The name Anasazi has long been used for the prehistoric farmers of the Four Corners. 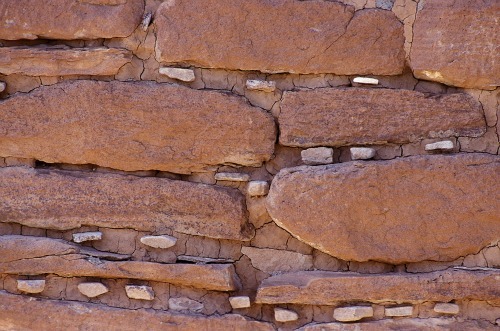 The term now favored is ancestral Puebloan, indicating they were the ancestors of modern-day Puebloans. This page will deal only with the four units in Colorado. It is a continuation of my page on Hovenweep, Utah which covers the Cajon and Square Tower ruins, the visitor center, camping, hiking and lodging outside the Monument. The Holly Group is named for James M. Holly, a trading post operator at Aneth, Utah and later resident of McElmo Canyon, who conducted excavations here in the late 1800s. 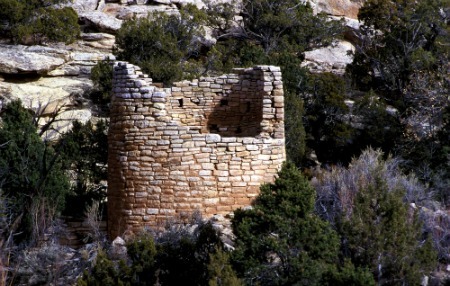 The Holly Site includes Holly House, Tilted Tower and Holly Tower, located at the head of Keeley Canyon. Books and Maps about Hovenweep may be purchased at the Visitor Center, or you may purchase them through Amazon.com by clicking the link below. Holly Tower is built on the top of a large boulder on the canyon bottom. Unlike other multi-story towers which were built with outside scaffolding, it appears that Holly Tower was built from the inside, building upward, one floor at a time. This group consists of Horseshoe House, for which the group is named and Horseshoe Tower. Horseshoe House is composed of four masonry structures that together form a horseshoe shape. Horseshoe Tower is built on a point from which observers could clearly look down into Horseshoe Canyon. This site is located about 500 yards east of the Horseshoe structures. Because of its proximity to a constant supply of water in the canyon, the Hackberry Group may have contained the largest population of all the Hovenweep groups. As many as 250 to 350 people may have lived here. 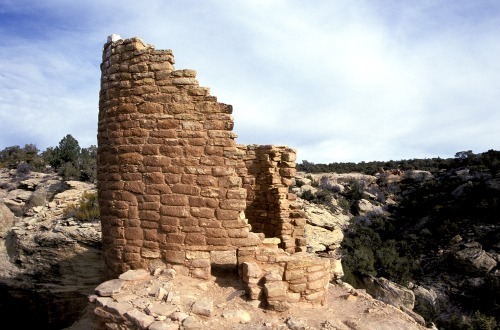 Unlike the other units in Hovenweep, which became a National Monument on March 2, 1923, when President Warren G. Harding proclaimed Hovenweep part of the National Park System, this group was not included until 1956. In fact, it was not “discovered” until 1929 when it was first documented by archaeologist Paul Martin. 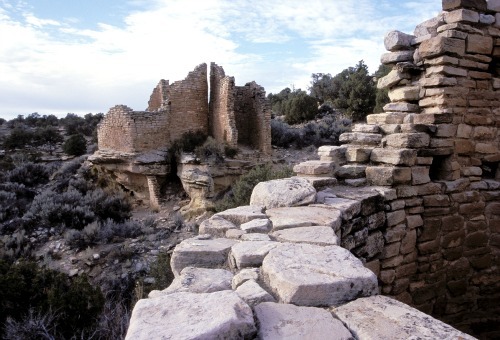 • Puebloan kivas are usually built into the earth, whereas the Cutthroat Castle kiva is incorporated into Cutthroat Castle, which rests on top of a boulder. However, there is presently a page under construction on the NPS Hovenweep website. “…the 142-acre unit comprises one of the best-preserved archaeological landscapes in the Mesa Verde region…. 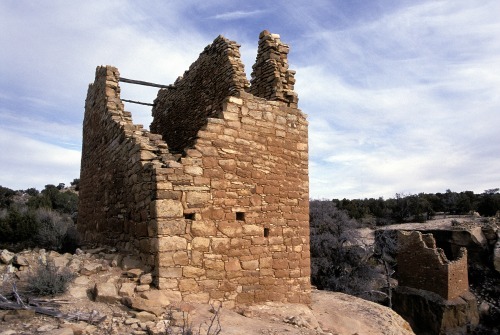 Goodman Point Pueblo, the largest site in the unit and one of the largest in the entire region, is listed on the National Register of Historic Places….